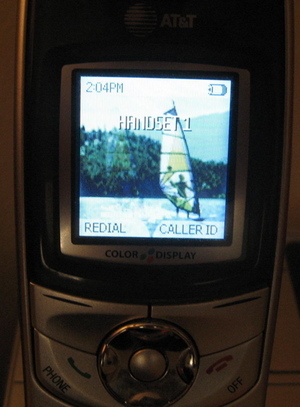 ATT's 5.8 digital telephone model EP5995 has a windsurfer screen background. A sailor crosses the screen on what looks like a 5.0, and waves to the camera. He might be in Bonaire, at the far end of Lac Bay by the mangroves. I bought this phone for our home without knowing about the windsurfer. Really. Really truly. If you're looking for a windsurfing gift for the windsurfer who has everything, this could be it.